Carlos Checa Yamaha YZR M1 2004 1/18 scale model by Maisto. 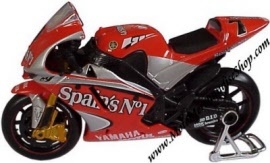 This is a truly great model of Carlos's 2004 Team Gauloises Fortuna Yamaha YZR M1 which he rode in the 2004 MotoGP championship. It is built in the convenient scale of 1:18 which results in a model of some 11 cm, or 4 1/4 inches, in length. Despite the rather small scale, it still shows incredible detail and at this price everybody can afford it! Free Postage, Packing & Handling to ANY destination in the world !